Work: Admitted to Massachusetts Bar, 1757; Elected to Provincial Assembly, 1770; Delegate to the Continental Congress, 1774, 1776; Attorney General for Massachusetts, 1777-1796; Judge, Supreme Court of Massachusetts, 1796-1804; State counselor, 1804. Robert Treat Paine was a native of Massachusetts, born in 1731. He was expected, by family tradition, to become a Minister. He got high marks at the Boston Latin School and was admitted to Harvard College, where he graduated in 1749. He taught school for a while and then began the study of theology. Because of his frail health, Paine set out to build up his strength by working on the sea. He spent some years as a merchant marine visiting the southern colonies, Spain, the Azores, and England. When he returned home he decided to pursue the law. He was admitted to the bar of Massachusetts in 1757. He first set up office in Portland, Maine (then part of Massachusetts) and later relocated to Taunton, Massachusetts. In the trials of British soldiers following the Boston Massacre, Paine served as associate prosecuting attorney. He was elected to the Provincial Assembly in 1770 and that body selected him in 1774 to attend the first Continenetal Congress. Paine served on committees which formed the rules of debate, and later served as chairman of the committee charged with acquiring gunpowder for the Continental Army. He also signed the final appeal to the king, known as the Olive Branch Petition, in 1775. 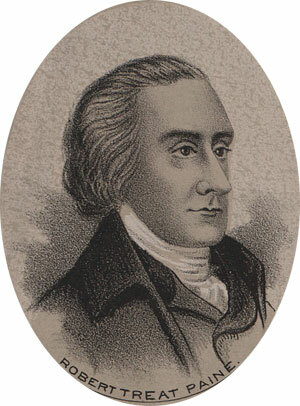 Paine was reelected to represent Massachusetts at the Continental Congress of 1776. He participated in the debates leading to the resolution for Independence and his signature appears on the Declaration. According to comments made by Benjamin Rush, Paine was known in Congress as the "Objection Maker," because of his habit of frequent objections to the proposals of others. These objections were eventually taken lightly, for as Rush commented, "He seldom proposed anything, but opposed nearly every measure that was proposed by other people..."
In 1777 Paine was elected attorney general of the state of Massachusetts. He was then serving on the legislative committee to draft the first constitution of the state under the new federation. He moved back to Boston in 1780 where he helped found the American Academy of Arts and Sciences. Governor Hancock offered him an appointment to the bench of the Supreme Court in 1783 but he declined. That offer was made again in 1796 and he accepted. He retired after some 14 years, in failing health, then died at the age of 83.